In a recent Ovum survey, 75% of customers indicated that they have successfully resolved their issues on the phone, compared with just 11% on a website and 5% via social media. Customers are increasingly drawn to digital channels to find information but the phone remains a prominent way for resolutions to complex and urgent queries. 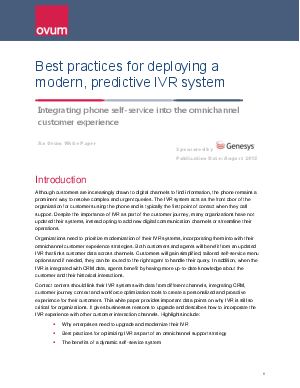 When surveyed about their frustrations with customer service, IVR was pinpointed as the biggest issue by 43% of customers. If you are running a contact center or care about your customer experience, you had better update your IVR.